Breaking news: Adam West passed away last night after a short battle with leukemia. He is best remembered for embodying the role of Batman in the 1960s. West had been a struggling actor in television and film, his first big role was with Paul Newman in The Young Philadelphians, but his career went meteoric when he accepted the lead role in William Dozier's tongue-in-cheek production of Batman for 20th Century Fox (1966-1968). They assembled a perfect team to bring the comic book adventures to the small screen and their combined sensibilities resulted in one of the most influential and iconic creations of the decade. Between the comedic timing of the actors, the colorful sets, the Dutch angle camera work, and on-screen typeface (Pow! Biff! 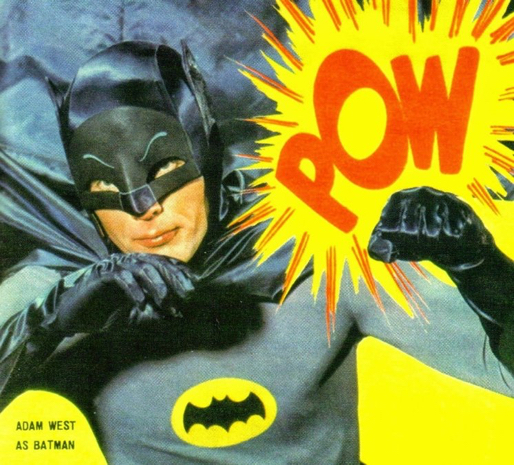 ), Batman brought Pop Art to mainstream television. The success of the show's campy quality also reverberated, for better or for worse, throughout other programs, such as The Man From U.N.C.L.E. and Lost In Space, which scrambled to compete for laughs and entertainment. But West's success also came at a cost. The actor found himself struggling once again to find work after Batman, which had typecast him forever in the industry as the caped crusader. West said that he eventually had to make peace with Batman and embrace the role and his loyal fans. He told Variety: "I decided that since so many people love Batman, I might as well love it too. Why not? So I began to reengage myself with Batman. And I saw the comedy. I saw the love people had for it, and I just embraced it." The spirit of this reconciliation was captured beautifully in a 1992 episode of Batman: The Animated Series, where West played a masked hero on TV and boyhood idol of young Bruce Wayne, The Gray Ghost (Beware the Gray Ghost). Fittingly, Bruce's faith in his hero is reaffirmed years later when the Gray Ghost comes to his aid during a mission. The interplay between the characters was quite moving. 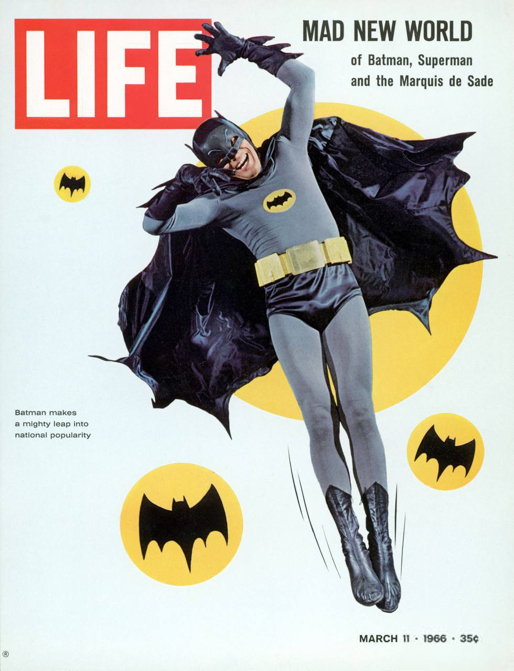 West's 1966 Batman saw a huge resurgence in the last few years. DC comics launched a new comic series based on the show's Pop Art style and humor, and a line of new toys were licensed. Spy Vibers were even treated to crossover titles with Batman paired with The Man From U.N.C.L.E. and The Avengers. Fans were once again seeing the familiar faces of West, Ward, Newmar, and the rest of the cast. And after decades of negotiations, the series was finally released on DVD and Blu-ray in 2014. The cast also reprised their roles for an animated Batman film, Return of the Caped Crusaders, in 2016. More below. My first encounter with Adam West's Batman was in the late 1960s during the show's final season. Like most little kids, I was glued to the TV set to see Batman and Robin foil the fiendish plots of one of the greatest rogue's galleries of villains ever assembled: Catwoman (Julie Newmar), Joker (Cesar Romero), Penguin (Burgess Meredith), Riddler (Frank Gorshin), Egghead (Vincent Price), and many others. One of my earliest memories is sitting in my best friend's garage, where his parent's parked their long black Cadillac (with fins!). We'd pretend it was the Batmobile and turn the steering wheel and push buttons. Elements like the Batcave, the Batmobile, and all those marvelous gadgets were my introduction to the world of Spy-Fi. Sitting in the car, we were Batman and Robin, racing around Gotham City in high adventure. Batman was one of those shows that balanced humor and drama. While the adults may have been laughing, we kids were on the edge of our seats, worried about how our heroes would escape the death traps that famously ended every cliffhanger episode. For me there was a real sense of danger! Batman and Robin would be tied to a giant waffle iron, or some such contraption, and William Dozier's voice would come on to urge us to tune in again, "same Bat-time, same Bat-channel", to see if they would survive. They always did. I saw Adam West in person just about seven weeks ago at a large convention. He was riding on a mobility scooter and passed right by me toward a massive crowd of fans waiting to meet West and co-star Burt Ward. It was thrilling to see my boyhood idol. But the real highlight was that he drove toward the cheering crowd, then in almost Blake Edwards perfect timing, he did a U-turn and rode away for a second. He was grinning from ear to ear. The crowd erupted in laughter. We all loved him. Adam West's family released this statement today: "Our dad always saw himself as The Bright Knight, and aspired to make a positive impact on his fans’ lives. He was and always will be our hero." He was 88 years old. Related posts: Interview: Batman Celebration Book, Batman Anniversary, Interview: Batman Animated designer Shane Glines Interview, Interview: Ralph Garman and Ty Templeton, Interview: Ryan Heshka, Batman TV and Manga releases, Batman 66: The TV Stories Book, Batman in Swinging London, Julie Newmar, Batman 66 posters, Adam West Sings!, Adam West spy ad, Spy Vibe visits the Batcave, James Bond & Batman Robots, Andy Warhol Batman, Man From UNCLE & Batman Manga. Selected Spy Vibe Posts: Village Triangle, Roger Moore R.I.P., Spy Vibe Radio 3, Sgt Pepper 50th, Satanik Kriminal OST, 60s Overdrive, Make Love in London, Spy Vibe Radio 2, Spy Vibe Radio 1, James Bond Strips, Propaganda Mabuse, Fahrenheit 451 50th, Interview: Police Surgeon, XTC Avengers, 1966 Pep Spies, Batman Book Interview, Exclusive Fleming Interview, Avengers Comic Strips, Robert Vaughn RIP, UNCLE Fashions, Thunderbirds Are Pop!, Interview:Spy Film Guide, Lost Avengers Found, The Callan File, Mission Impossible 50th, Green Hornet 50th, Star Trek 50th, Portmeirion Photography 1, Filming the Prisoner, Gaiman McGinnins Project, Ian Fleming Grave, Revolver at 50, Karen Romanko Interview, Mod Tales 2, Umbrella Man: Patrick Macnee, New Beatles Film, The Curious Camera, Esterel Fashion 1966, Exclusive Ian Ogilvy Interview, 007 Tribute Covers, The Phantom Avon novels return, Ian Fleming Festival, Argoman Design, Sylvia Anderson R.I.P., Ken Adam R.I.P., George Martin R.I.P., The New Avengers Comics, Trina Robbins Interview, The Phantom at 80, 007 Manga, Avengerworld Book, Diana Rigg Auto Show, The Prisoner Audio Drama Review, David McCallum novel, Andre Courreges R.I.P., Who's Talking on Spy Vibe, UFO Blu-ray, Avengers Pop Art. Thanks Mitch. It's a tough period. We continue to lose our heroes and the people who shaped the culture in the 60s (and beyond).